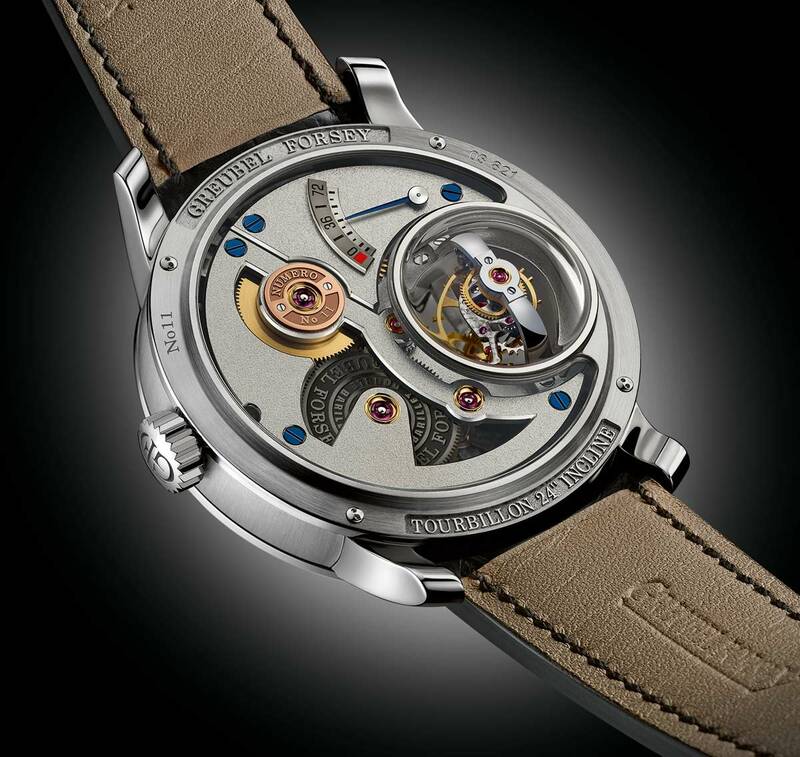 First presented at the Salon International de la Haute Horlogerie (SIHH) 2015 in white gold with an argenté dial, the Greubel Forsey Tourbillon 24 Secondes Vision was awarded in 2015 with the Aiguille d’Or by the jury of the Grand Prix d’Horlogerie de Genève. 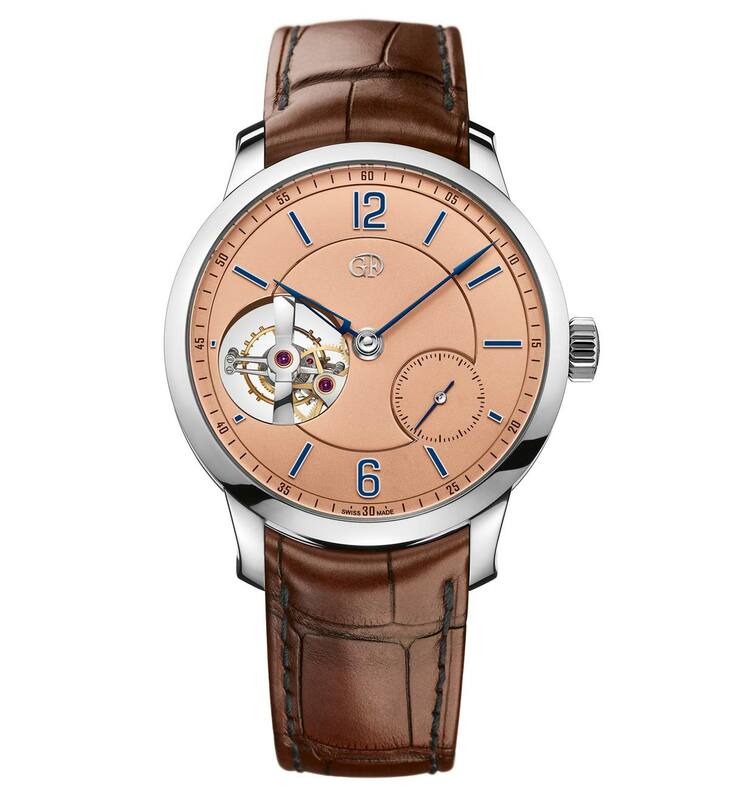 In 2016 the line expands with a new model in platinum with a distinctive Salmon-colour dial. To generate the volume required to house the sophisticated Tourbillon 24 Secondes mechanism without comprising the elegant lines and slim profile of the case, Greubel Forsey incorporated a sapphire crystal dome into the back of the timepiece. 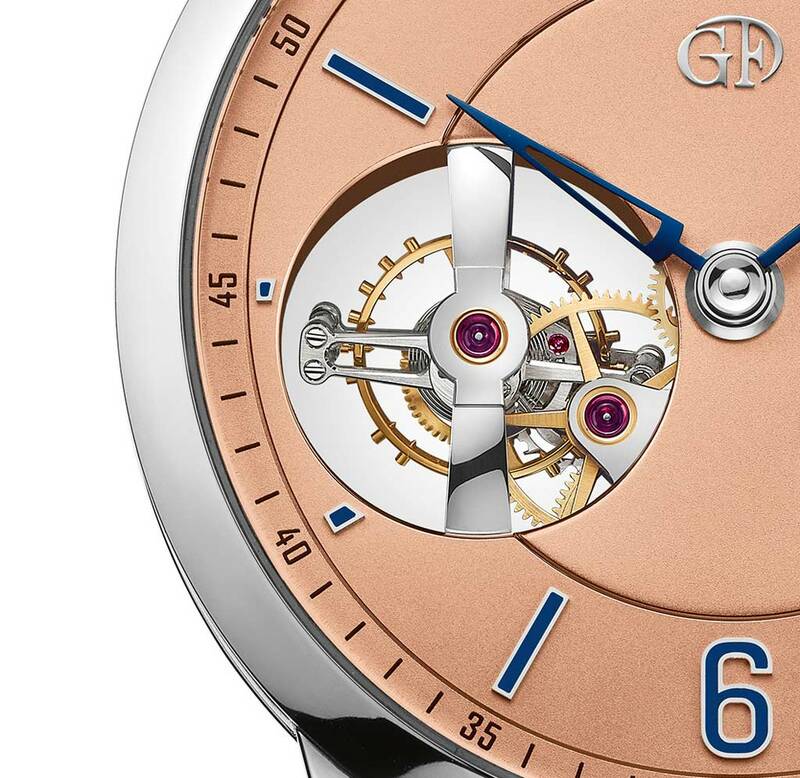 This solution offers the advantage to fully appreciate rotation of the tourbillon from various angles. The front and back curved tourbillon bridges are accurately polished by hand to obtain a perfectly regular reflection over the whole piece. Each bridge finished in this way is discretely signed by the craftsman-decorator who executed it. The movement’s 293 parts, whether visible or not, are also finished in line with the most demanding Haute Horlogerie standards. Beating at 21,600 vibrations per hour, the movement guarantees a power reserve of 72 hours thanks to two series-coupled fast rotating barrels (1 turn in 3.2 hours), one of which is equipped with a slipping spring to avoid excess tension. The 43.50 mm x 13.65 mm (16.03 mm if you consider the sapphire crystal dome) platinum case is fitted with 5N PVD-treated white gold dial. The warm Salmon nuance is beautifully matched to hour, minute and small seconds hands made of polished blued steel and precious “oven fired” enamelled applied (émail grand feu champlevé) indices. 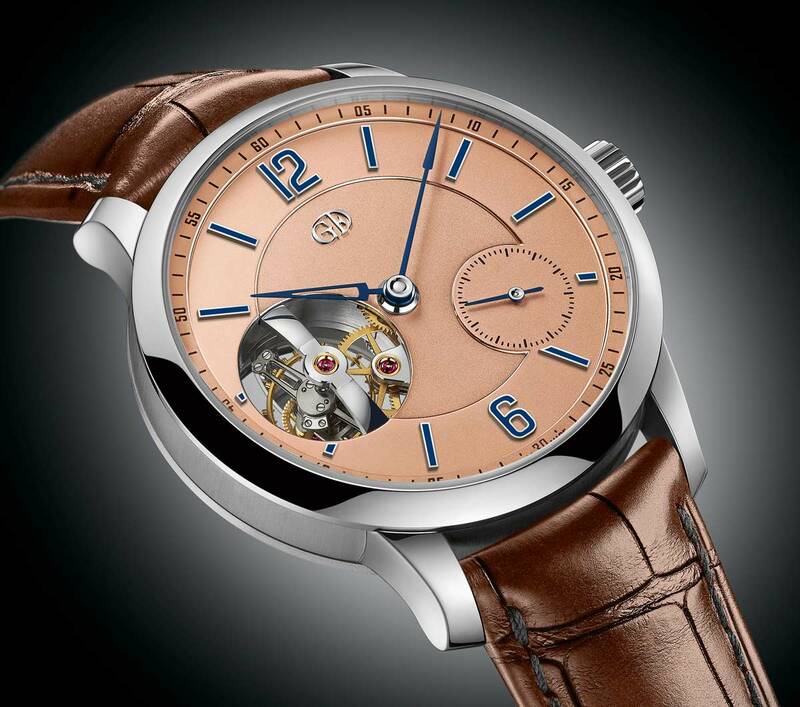 Greubel Forsey Tourbillon 24 Secondes Vision Salmon Dial. 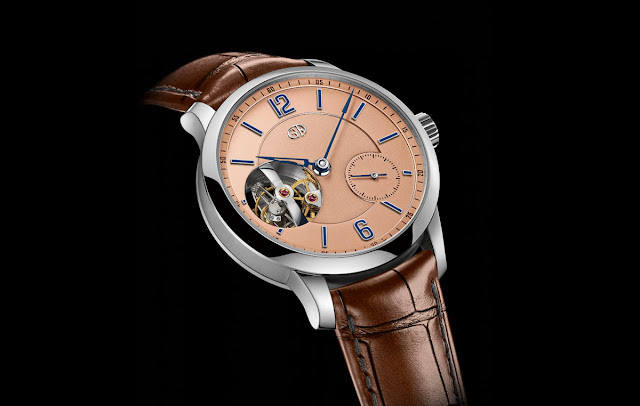 First presented at SIHH 2015 in white gold with an argenté dial, the Greubel Forsey Tourbillon 24 Secondes Vision was awarded in 2015 with the Aiguille d’Or by the jury of the Grand Prix d’Horlogerie de Genève. In 2016 the line expands with a new model in platinum with a distinctive Salmon-colour dial. Tourbillon 24 Secondes Vision in platinum with Salmon dial. Price on request.